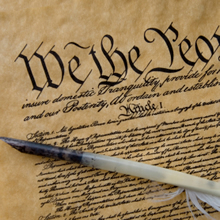 APU joins with schools across the nation in celebrating Constitution Day. Students are invited to join the POLI 150 class, Introduction to American Government, led by Erin Brooks, professor of history and political science, on Friday, September 16, from 12:50-1:45 p.m. in the Ronald Building, Room 113, for a lecture and discussion on "The Constitiution as a Point of Pride: Natural Rights and American Character." The lecture is open to all students and includes pizza and refreshments. Senator Robert C. Byrd, a West Virginia Democrat and Congress' unofficial constitutional scholar, believes that American primary, secondary, and post-secondary students lack significant knowledge regarding the United States Constitution. In December 2004, Senator Byrd proposed an amendment that was passed by the House of Representatives and the Senate as a way to help increase students' knowledge about the constitution. Legislation requires that all educational institutions receiving federal funds implement educational programs relating the U.S. Constitution on September 17 of each year. This date was selected in recognition of September 17, 1787, when the 39 delegates of the Constitutional Convention met for the last time to sign the United States Constitution and present it to the American public, changing the course of history. Take a moment to browse resources with more information about the U.S. Constitution.